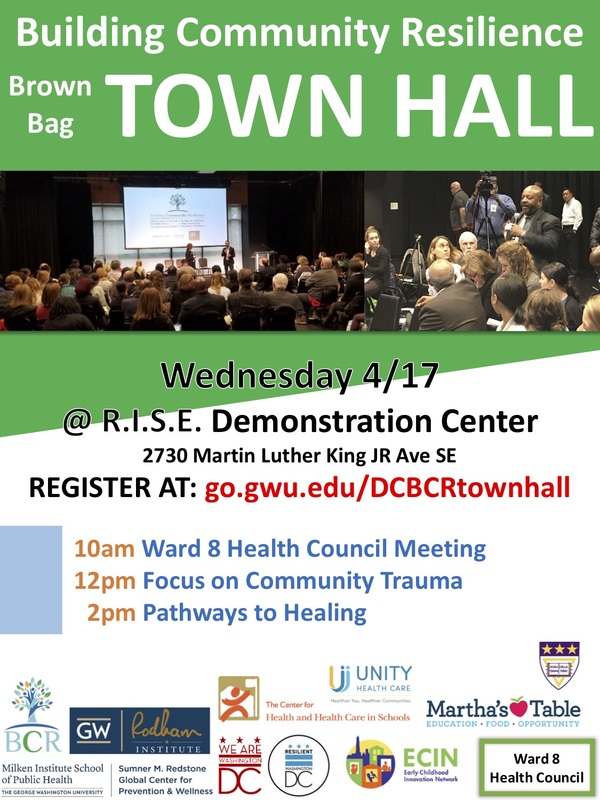 On Wednesday, April 17th at 12pm, the Building Community Resilience (BCR) collaborative and network will convene local partners, including from GWU, Reaching Out to Others Together (ROOT), the Metropolitan Police Department (MPD), the Department of Parks and Recreation (DPR), and others to discuss efforts to address community trauma, violence, community-police relations, and pathways to healing. BCR seeks to improve the health and life outcomes of children, families, and communities by addressing the ‘Pair of ACEs’ – adverse childhood experiences in the context of adverse community environments. By aligning systems large and small, the BCR process supports co-created solutions that enable communities to not only ‘bounce back’ in the face of adversity, but bounce forward. "Speaker details and RSVP here". Please join us!